Salt Lake City, Utah – July 26, 2017 – Monnit Corporation (www.monnit.com) today, announced the release of new wireless thermocouple sensors. 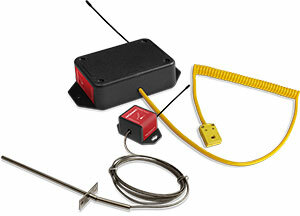 The Wireless Thermocouple Sensor is available with a hardwired K-type thermocouple capable of measuring temperatures up to 400°C (752°F), or a K-type quick connect pigtail to support various thermocouple types and ranges. Monnit also offers the K-type quick connect with an included needle probe thermocouple that can measure temperatures up to 400°C (752°F). These new sensors are available in coin cell, AA and Industrial formats for both standard Monnit and ALTA platforms. The sensor will measure temperature where needed and send the data to the iMonnit Online Sensor Monitoring and Notification System. The data is stored in the online system and can be reviewed and exported as a data sheet or graph. User customization allows you to set notifications and alerts from the system so you can know immediately if temperatures are above or below an optimal range. The sensor probe features mounting flanges and can be easily installed for long term use. Hilltop Cranberry Co. was searching for a reliable solution to help them protect their temperature-sensitive crops. The requirements were that it needed to be wireless (with a long enough range to span their fields), weatherproof, be battery powered (without the need to change batteries often) and provide timely alerts via phone call or text message when temperatures drop below a specified point. They found the exact solution they needed with Monnit’s new ALTA Internet of Things Sensors. 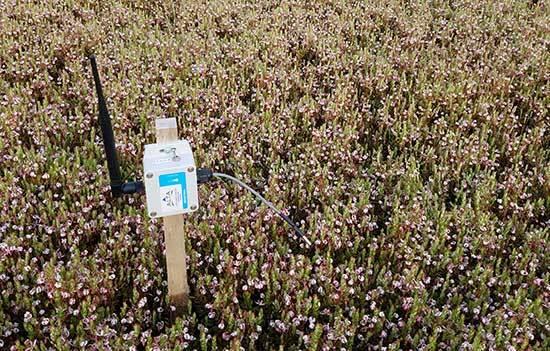 The solution consists of temperature and humidity sensors that transmit measurements wirelessly to a receiver. The Monnit cloud-based solution can then issue alerts to the company at any time, day or night, when conditions are such that the plants and their berries are at risk. The system, installed this spring, not only prevents the potential loss of an entire crop if the temperature dips too low, but also provides owner Travis Tritz with a better night’s sleep, since he doesn’t need to spend cool nights watching the temperatures. SALT LAKE CITY, UTAH – July 5, 2017 – Monnit Corporation today announced that it has signed a distribution agreement with Ingram Micro Canada as part of their new IoTvantage™ Premier Internet of Things Partner Program. Under the distribution agreement, Ingram Micro, a global leader in technology solutions, mobility, cloud, and supply chain services, will sell Monnit’s ALTA wireless sensing solutions, the only wireless sensor platform available today that offers 1,000+ feet wireless range (non-line-of-sight), 10+ year battery life and integrated bank-level security. “Monnit’s horizontal approach offering productized off the shelf sensors is appealing to Ingram Micro’s extensive network of channel partners in Canada. It provides us with the hardware flexibility to build IoT solutions for multiple verticals without the need for hardware engineers. It works well with our IoT strategy and Ingram Micro’s best of breed vendor portfolio to create a diversified and all-encompassing ecosystem,” said Dave Mason, Executive Director, Advanced Solutions, Ingram Micro Canada. Monnit’s solutions will be available to Ingram Micro customers via ten market specific application kits with either cellular or Ethernet connectivity. Current application kits include; Commercial Refrigeration, Remote Real Estate, HVAC, Pharmacy/Lab, IT Server Room, Corporate Property, Agriculture, Mobile Refrigeration, Industrial Manufacturing and Small Business. Each kit includes everything needed to get started and requires less than 5 minutes to set up.